With it following a Friday, you’d have been forgiven for thinking that day three of IBC2018 would be host to a few bleary eyes. But in actual fact you couldn’t have been further from the truth. The third day of the world’s most influential media, entertainment & technology show kicked off with a 4k charity run completed by over 500 IBC participants, raising over $40k in the process for two fantastic Dutch charities: Stichting NewTechKids (NewTechKids Foundation) and Iridescent. Meanwhile, during a press conference in the media centre, some of the key figures at IBC revealed some of the early successes of this year’s show. This included the fact that the number of female speakers on stage this year has more than doubled last year’s line-up, while IBC2018 has also attracted a record number of 1,700 exhibitors. 5G also continued to be a key topic of discussion during the day’s conference programme. 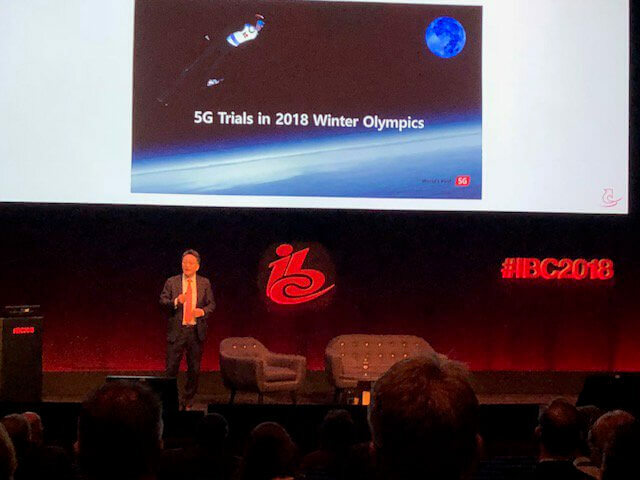 Mark Hyung-Joon Kim, EVP & Head of Global Business Unit at Korea Telecom (KT), provided a fantastic behind-the-scenes glimpse from into how KT was able to deliver the world’s first trial of 5G services at the 2018 Winter Olympics in Pyeongchang. He then revealed how 2,294 minutes of coverage (including highlights) during the 2018 Games had been broadcast and delivered through KT’s 5G technologies. This included providing audiences with a live feed from the viewpoint of athletes competing in the bobsleigh, which was facilitated via a sync camera embedded within the front of the bobsleigh in real time via a 5G module and network. Harris also described how Three is working hard to change its business model and public perception. He outlined a commitment to stay relevant by changing the company’s organisational culture to better engage with the whole media-telco ecosystem. James is a Senior Account Director at Liberty Communications.